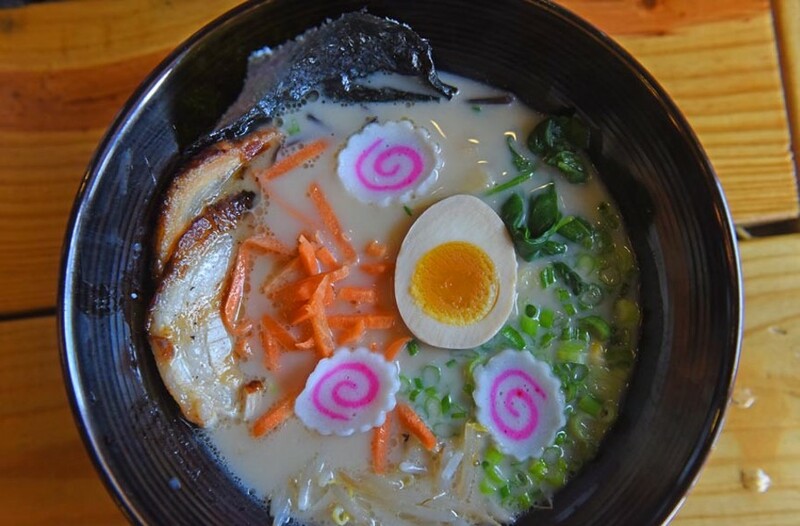 Food Review: Put Takara Ramen on Your Noodle Tour of Richmond | Food and Drink | Style Weekly - Richmond, VA local news, arts, and events. Scott Elmquist Takara’s signature ramen is brimming with noodles, pork, lots of vegetables, a soft-boiled egg and fish cakes. In case there’s any question about how to tackle the bowl in front of you, this restaurant spells it out on a how-to chalkboard hanging over the kitchen. 1. Grab your chopsticks and spoon. 2. Start by tasting the noodles and broth. 3. Eat fast when it’s hot. While moving through these five easy steps, you can expect to be entertained by nonstop K-pop music videos playing on a nearby screen that provide a Technicolor soundtrack to your slurping. The 40-seat Takara Ramen is arranged like a traditional ramen shop with low stools at six community tables outfitted with all the essentials — napkin dispensers, packaged chopsticks, sauces and, once you’re seated, bottles of water — laid out under paper lanterns. Along one wall is a small metal-toned bar offering nine draft beers, three bottled beers and six kinds of sake, while a similar counter fronts the kitchen. Polite servers with a bent for efficiency take your order once they seat you — this is no fast-casual spot, although food arrives so quickly, it’s astonishing. Takara’s ample appetizer menu offers ways to front load before a meal of soup. For a traditional take, try chashu buns ($3.50 each) of pork belly, scallions, cucumber and spicy mayonnaise inside pillows of steamed bun — or the more Americanized chicken salad buns ($3.50) loaded with chicken, cucumber, carrots and mayonnaise. The bright green color of vegetable gyoza ($4) announces the heady freshness of dumplings — meat lovers won’t miss the pork. Inexplicably, the kitchen was out of spicy tuna salad ($8) on all three of my visits. An ideal entry dish for ramen newbies is chicken shio ramen ($10) — its pale yellow broth and straight noodles as familiar as Mom’s chicken soup if hers had the fermented bamboo shoots known as menma among the chicken and vegetables. It’s not every day you see a bowl of red ramen, but spicy miso ramen ($11) is noteworthy for more than its hue. The marriage of pork-based broth with spicy, garlic-chili miso creates a robust and sassy pool in which pork, curly noodles, spinach, corn, green onion, a soft-boiled egg and roasted sprouts compete for space. The rich pork-based broth of Takara’s signature tonkotsu ramen ($10.50) is nearly opaque, but lurking underneath are straight noodles, pork aplenty, lots of vegetables including spinach, a soft-boiled egg and fish cakes. It only sounds like an embarrassment of food until you begin step No. 2 with the meaty, garlic-flavored broth and then find yourself finishing step No. 5 too soon. Far more delicately flavored is chicken curry ramen ($11), starring curvy noodles with a supporting cast of buttered corn, kikurage mushrooms, egg, spinach and roasted sprouts swimming in broth that hints at curry rather than hitting you over the head with it. If you’re into competitive eating or just like a chance to eat for free, Takara has the deal for you. One day a month, it offers a gigantic ramen bowl special all day long. Order it and you’ll come face to face with about the equivalent of four servings in one enormous bowl. Finish every drop in 30 minutes, and it’s not only on the house, but you’ll also get a T-shirt and your name on the gigantic ramen hall of fame chalkboard. But it’s a lot of slurping. Many have tried, but few have succeeded — the last time a customer managed to beat the house was in November. When soup isn’t calling to you, consider a rice bowl such as oyako don ($8), so named because oyako means parent and child, represented here by chicken and egg simmered with scallions, sesame oil and Japanese pickles. Likewise, a skewer of pork belly ($3), soy-sauce-marinated chicken ($2.75), Korean galbi sauce-marinated beef ($3.50) or sea salt-and-pepper shrimp ($2.50) offer mix-and-match options for those not in a soup frame of mind. Mondays-Thursdays 11 a.m.-3 p.m. and 5-9 p.m.; Fridays 11 a.m.-3 p.m. and 5-10 p.m.; Saturdays 11 a.m.-10 p.m.; Sundays 11 a.m.-9 p.m.